Cool Flames Potholder -- A free Crochet pattern from Julie A Bolduc. 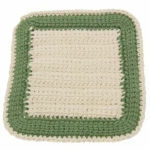 This potholder reminds me of the look of a gas stove burner that has been turned on. It is made in two pieces that are crocheted together around the outside. This makes it possible to insert a thick insulating circle of fabric if you want to. But since this potholder is thick by design it is not necessary.